We extracted honey this weekend from our backyard hive. The late date of this final extraction is evident in the density of the deep-amber goldenrod-dominant honey. Its slow movement through the series of filters on a cold day reminds our family that we should be out apple picking rather than forcing our bees to further stock up for winter on chilly days. I worry every year that we have taken too much too late from the bees as I watch the late-blooming asters begin to wilt at the beginning of fall. The forage for our honeybee colony is reduced this time of year as they work harder to fill and cap their final honey chambers for winter. The dynamics of supply and demand have reversed. Where flowering plants have competed for pollinators throughout the spring, summer and early fall, the pollinating insects now face a shortage of pollens and nectar as most flowers and deciduous plants have senesced for the year. However, one plant, witch-hazel, has evolved to capitalize on this shift. On the cold days of fall when other plants have lost their color, witch-hazel bursts into a show of yellow flowers beckoning our bees from the warmth of the hive to forage just a bit further into the fall. 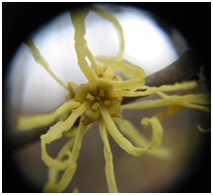 Witch hazel flower photo taken by Neahga Leonard through a hand lens for magnification. Witch-hazel, Hamamelis virginiana, is a shrub native to Vermont and a common understory tree with a high shade tolerance. Its anti-competition-late-season-pollination strategy comes with additional adaptations to produce a viable seed crop and environment for germination. Like our honeybees, which remain in the hive on colder days to protect the queen, few other pollinators remain flying this late in the season. While witch-hazel does not compete with other flowering plants for pollinators, it does contend with temperatures and reduced daily sunlight that signal pollinators to reduce their flight. For this reason, most of the witch-hazel flowers go without pollination and the plant produces few fruits. With its leaves dropped, witch-hazel’s other unique adaptation becomes evident against the backdrop of the bare northern hardwood forest in the fall. 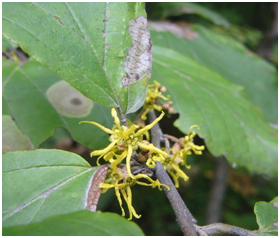 Unlike other plants, witch-hazel flowers and fruits simultaneously. The fruits, however, are a full year behind the flowers, having finally matured from last year’s mid-fall pollination. They have persisted on the shrub all winter to mature in the fall along with the new flowers. Two shiny black seeds are ejected explosively (a distance up to 3 meters) from the woody capsules. One theory of the name witch-hazel is attributed to the sound of the expelled seeds hitting the dry leaves of the forest floor. People associated this eerie phenomenon with witchcraft practiced deep in the woods on still autumn days. This theory competes with the more popular reason behind the name. The bendable, forked branches were used by witches as dowsing rods, wishbone-shaped twigs, to find groundwater sources, valuable metals, or even missing children. Enjoy this last show in the woods once the blaze of foliage has come to an end and even the goldenrods have given up for the year. If you are lucky enough to witness the explosive seed dispersal and find the seeds among fallen leaves, the rich, white oily interior is edible, collected and prized in the past by Native Americans. Perhaps, it will be warm enough for our honeybees to make their final foraging flights to meet you there; their focus will be the flowers. This entry was posted in Uncategorized and tagged Leah. Bookmark the permalink.